You know when you're trying to decide what games you would like to get your hands on next, so you ask people questions, check out emulators, and shop eBay? Sometimes you stumble onto something that stands out in your eyes, and becomes a temporary grail until you get your hands on it. At the time of me writing this review, Master of Darkness is my grail. Master of Darkness is divided into five different stages, and each one of those is divided into three levels plus a boss fight at the end. This game is platforming action at it's best! What usually comes along with platform games? Bland level layouts. What does Master of Darkness come with in terms of layout? AWESOMENESS! Every level is kept interesting in design, screens going left or right, up or down to progress. Not only that, but within each section of each level, careful consideration was taken to make sure you remain focused on where you need to go. Clever placement of spikes to duck under or jump over to move forward, places where you need to utilize jumping off of stairs to get items, shortcuts in the levels; the layout is pretty much sheer genius. The enemy AI in the game is top notch. Bats do more than one kind of pattern, and all the enemies have totally different attack patterns. They seriously did a fabulous job with all of the baddies on this game! One gripe of mine is the bosses. Now, the bosses themselves aren't bad at all. They're actually good fights! The problem lies in how many there are. There is a fight at the end of each stage, but there are only a total of four boss characters! You have Jack The Ripper, a psychic girl, Count Massen, and the Count of all Counts, Dracula (you thought I was talking about Sesame Street for a minute, didn't you?). If you didn't fight Count Massen a total of three times, they could've included two more bosses. Well, I think at least one more boss would've been a nice addition. On the plus side, each fight with Count Massen DOES help spur the story forward, so it's a minimal gripe at best. Not to mention the last time you fight him is one of the most fun fights of any Master System game! 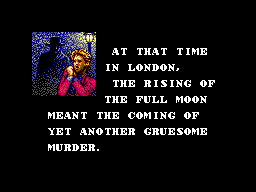 Oh, one other downside is that Dracula is stupidly easy... ugh. The weapons you can get along the way are sweet! You can get different main weapons, as well as different sub-weapons. Each weapon can be useful in different situations, so it behooves you to try and remember where you can find each one in particular spots of the game. While searching for those, you'll run across a ton of healing potions. There's actually a tad too many in the game; if there were a little less the challenge would've been greater. The look of this game is overall fantastic! The characters are all very well done. One of my favorite enemies are the wax statues that spring to life. Even the speed that they move toward you gives the game more of a haunting feel at that instant. The backgrounds are nothing short of awesome! Great detail on the bricks, trees - everything. The details thrown in at the Laboratory level really help to add to the environment, and keeps you within the context of the game. There are even foreground graphics on the game, which helps add to the depth of it, and once again, pushes you right into the game. There are also little cut-scenes to propel the story during play time. The graphics in those are nice too! They are almost like little cells straight out of a comic book. I would've liked a bit more of a gothic font in it, but that's not really a big deal. The tunes in Master of Darkness are fairly short, causing it too feel like there isn't much to the music. The melodies are perfect for every level though, so the short haunting-sounding songs aren't anything to get upset about. They actually make you feel like the levels are longer than what they are, but it doesn't make the game drag on one bit. In retrospect, that's actually kind of weird! The sound effects themselves are nicely employed. Not one sound stands out to make you say, "What the heck kind of noise was that?!" From the subtle sound of when you take damage, to the more noticeable noise of picking up a diamond and destroying all enemies on-screen, it all makes sense in terms of gaming. This game actually has some of the most balanced sound effects of any game I've ever played! The controls are VERY responsive. When you push the button to swing your weapon (or stab, depending on what weapon you have at the time), you immediately attack. There is no hesitation, making for a great offensive boost! The jump function of the game is phenomenal as well. You can control yourself in the air, which comes in mighty handy when you're up against a few bats at one time! Pushing up and attack at the same time lets you use a sub-weapon if you've found one. These weapons are limited in their number of uses, but can really save your hide. My biggest complaint about the controls is trying to go down any sets of stairs. It feels as if you have to be on a pixel perfect spot to move down them, resulting in having to do a ducking walk to get on them properly. Besides that, the methods used for the controls in the game are solid! 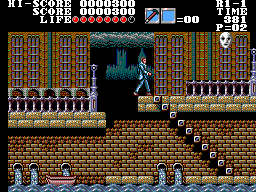 When you get in the later levels of the game, you will encounter different routes that you can take within each stage. It all ends up leading to the same place, but if you don't end up exploring every part of the level, well, there's some re-playability for you right there! On top of that, the game is pretty darn fun! More re-playability! If you like action games with a hint of adventure tossed in, this is one cartridge that you can't pass up. 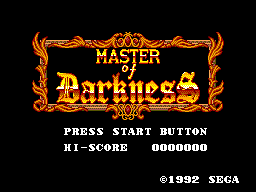 Master of Darkness takes platforming and adds nice little touches of exploration combined with a classic storyline to deliver one of the most pleasurable experiences on the Sega Master System!